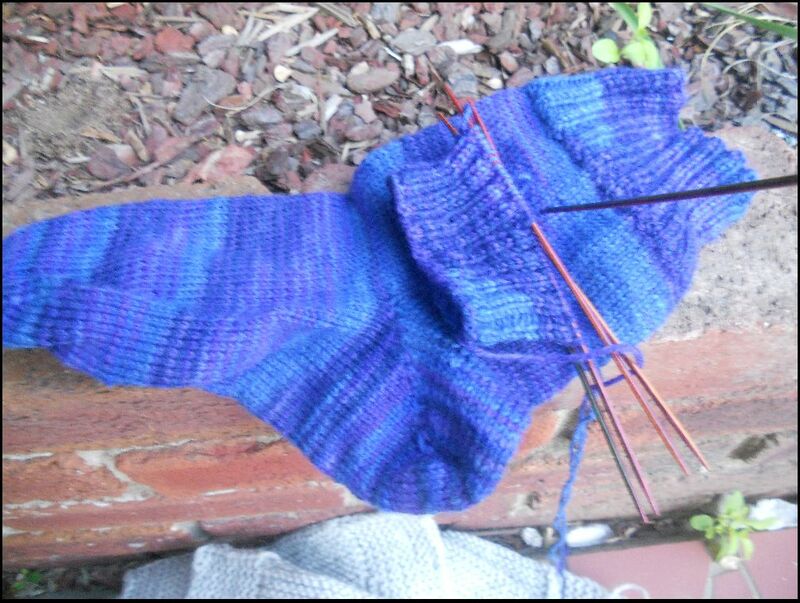 I'm halfway through another pair of socks -- maybe more than halfway, since I have one sock completed and one leg halfway finished. I'm using the Dragonfly Djini sock yarn I bought in Alexandria with the Cookie A pattern, Potamtomus socks, which was published on Knitty. The pattern is named after a genus of fish, and it does resemble fish scales. It's a great pattern, so good that I haven't suffered from second sock syndrome at all. I would be all steam ahead, except that something else is looming. 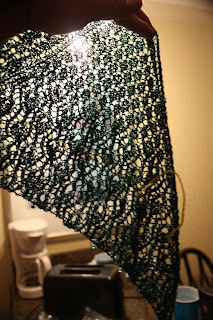 I bought the Peacock Feathers Shawl from Fiddlesticks Knitting. 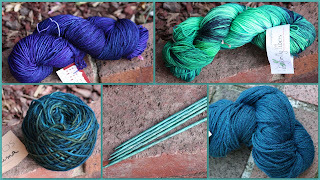 I'm planning on using Jaggerspun yarn, Zephyr in the Peacock colorway. 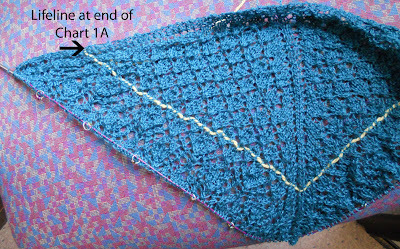 I've knitted the gauge suggested in the pattern using US size 3 needles. 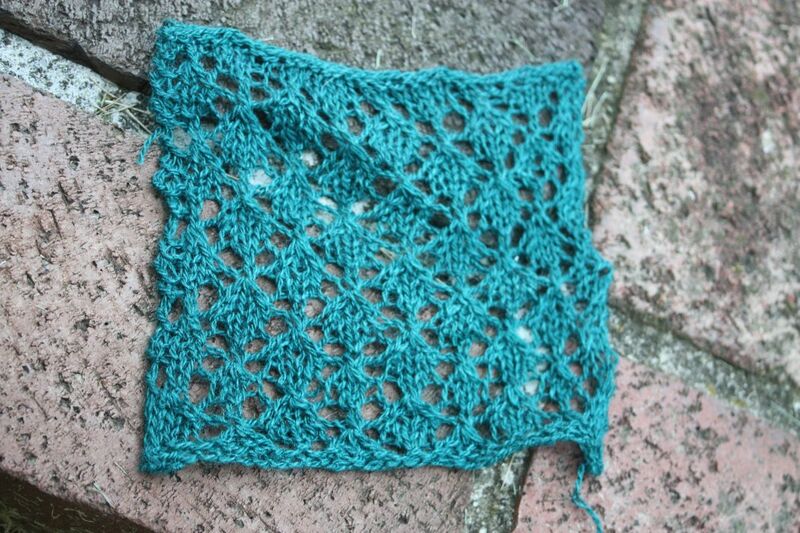 This is, once again, smaller than the suggested needle size -- I knit looser than the usual knitter. I had to order circular needles to begin the project. My handy dandy interchangables from Knitpicks doesn't go smaller than size US 4. So, this new project may distract me from the Potamtomus socks. Maybe I'll be able to work on them both at the same time? 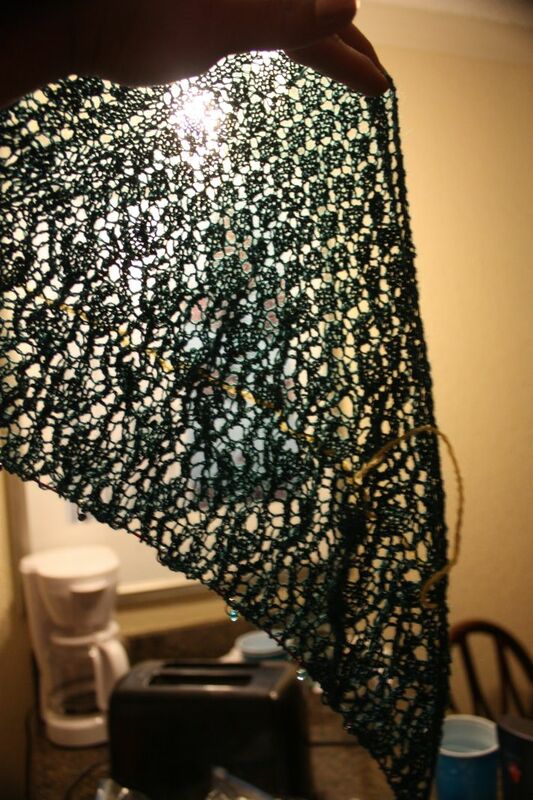 One of the yarns I bought in Alexandria was a Manos del Uruguay in a deep green. 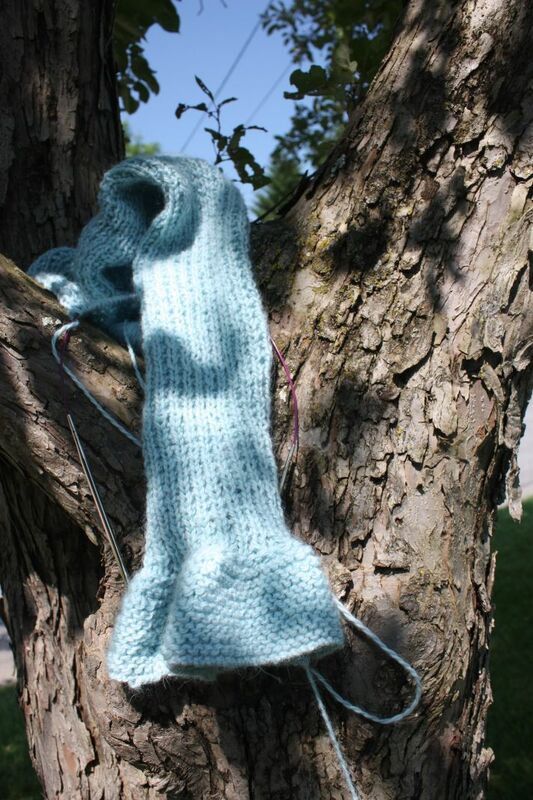 It's an unplied yarn. I bought to hanks of it, each of them 219 yards. 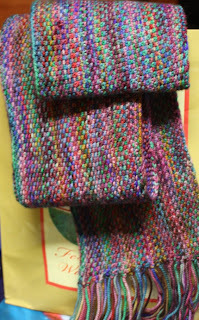 I knit a scarf with it. 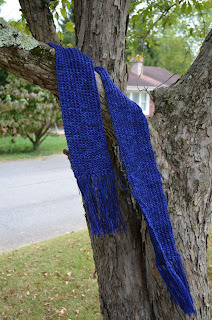 Pattern: Yarn Harlot's One Row scarf -- my "go to" scarf. I love this pattern. 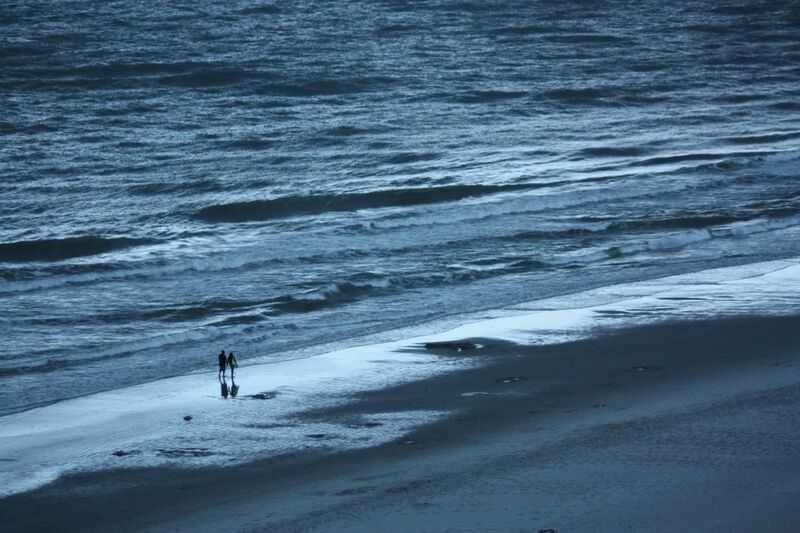 It usually creates an interesting play of color, although this time, not as much. This one is 34 stitches wide (instead of my usual 38) because the yarn is thicker than my usual worsted. 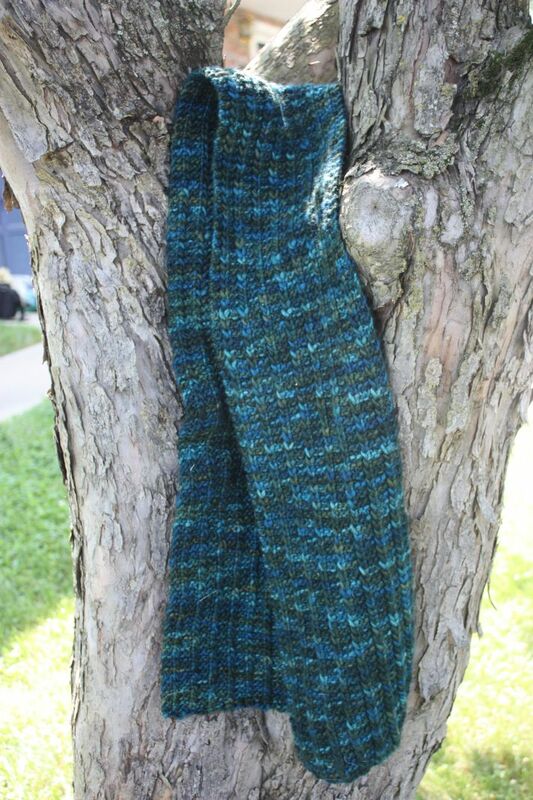 Needles: I just finished this scarf this weekend, and I can't remember if I used size 7 or 8. We'll say 7. Yarn: Manos del Uruguay Maxima, 2 hanks 100 g with 42 grams left over. I'm hoping to use that to make something to match the scarf. Or at least to trim something to match the scarf. Hat? Mittens? Where have those socks been? 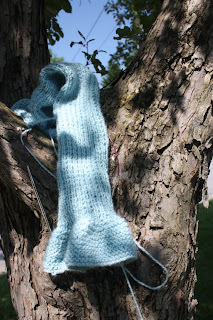 Have you seen on the Yarn Harlot's blog how her sock in progress will travel with her, seeing the sights? Famous people have held the sock in progress -- famous scenes have been photographed with the sock. My latest finished socks didn't meet anyone famous,but they are foreign born, and they did enjoy a relaxing few days on a beach. These socks began their lives at a resort in Punta Cana in the Dominican Republic during one of the most relaxing few days I have ever spent. It was a work trip for Steve, fun for me -- and I did nothing but sit by the pool or beach, read, listen to audio books and knit. Pattern: Once again, the Yarn Harlot's pattern: A good, plain sock from Knitting Rules. 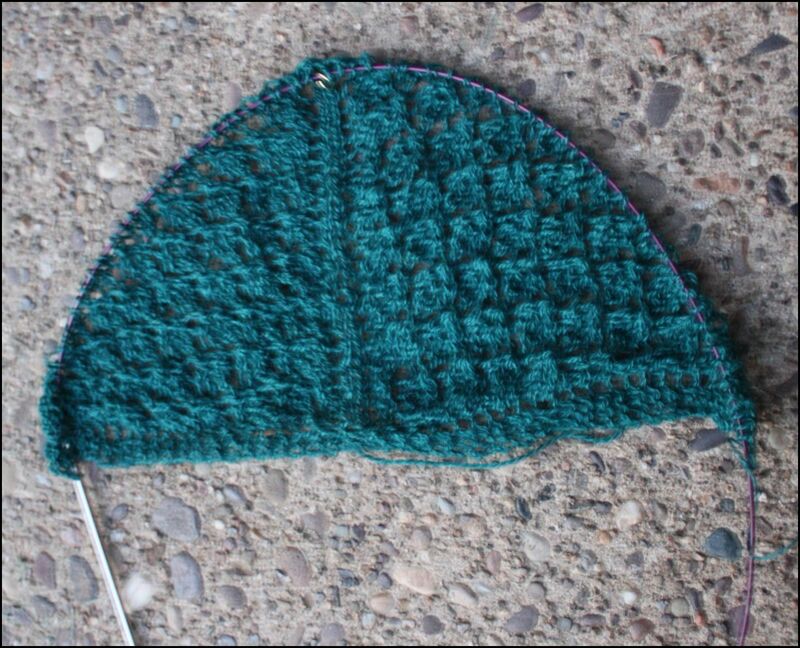 I cast on 68 instead of 64 and used a smaller needle size than specified. Other than that, no changes. Yarn: Berroco Sox in colorway Liverpool. 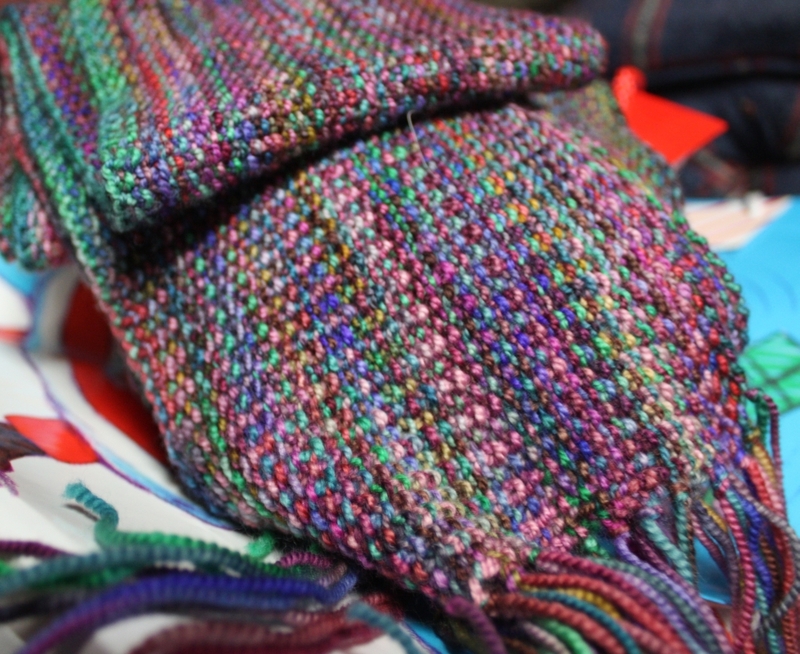 This is a self-striping yarn, so it was fun to watch the colors appear. The socks are not exactly alike -- off by just a couple of stripes. Needles: US size 1 (2.25 mm). I like this size for socks. 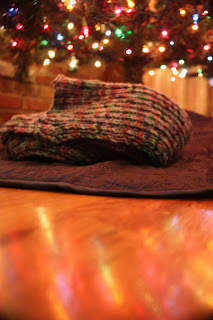 I finished the first sock on the plane on the way home -- knit in four days. I bought the book 60 Quick Knits from my "local" yarn storn in Lexington (two hours away). It's sixty patterns knit with Cascade 220. I thought it would provide a helpful reference for patterns using standard worsted wool - scarves, hats, and mittens. Yarn: Black Wool of the Andes from Knitpicks. Needles: US size 7. I started with double pointed needles, but switched to two circulars, and found that much easier and faster. 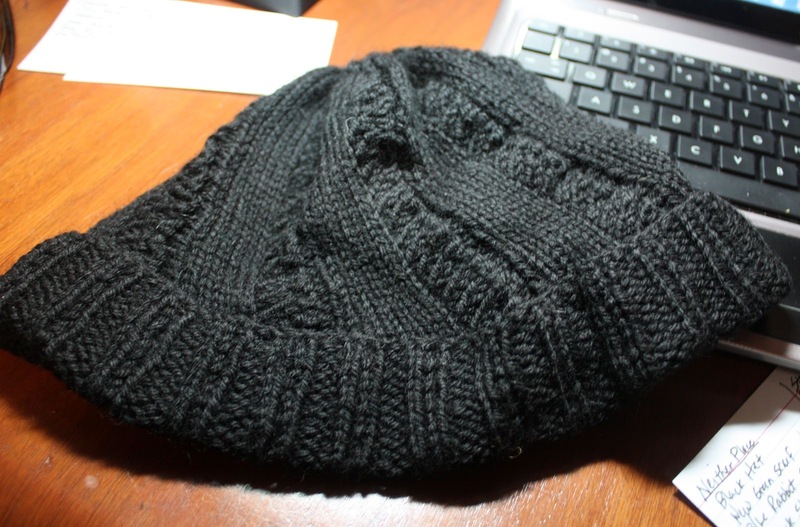 I blocked the hat on a bowl, and I think it's blocked too large. I think I need to reblock it smaller. I also started the Ruffled Scarf from the same book, using Knitpicks sugarbunny yarn in a pale blue. I like the ruffled boarded, but the scarf body rolls. And the yarn is very hairy. I'm not sure I'll finish it. We'll see. I'm still knitting! This project was finished in time to give as a Christmas gift to my mom. Steve and I were in Asheville, North Carolina, and we went to Yarn Paradise, a great yarn store. I've posted about this trip before. 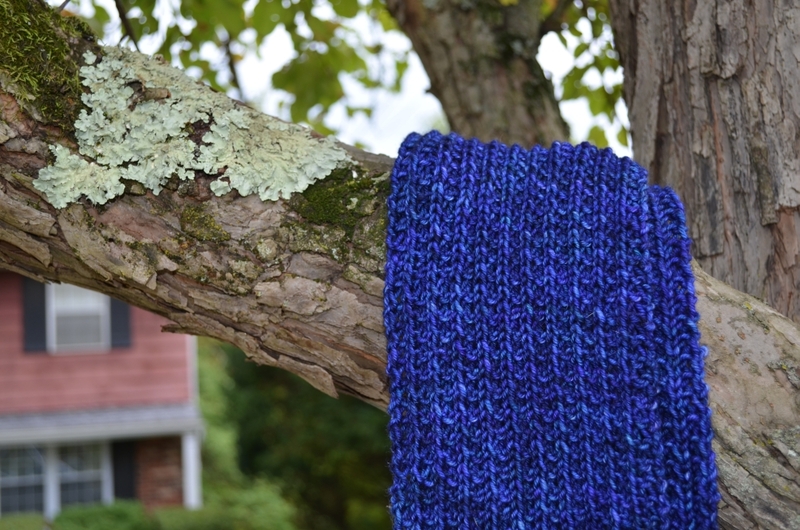 In the middle of one of the rooms of the store was a round table on which sat a large basket of Koigu yarn and several examples of this scarf. The sales clerk showed me that pattern and helped me to choose the yarns. Pattern: Koigu Linen Stitch scarf by Churchmouse Yarns and Teas. I bought it and the yarn I used to knit the scarf in November of 2010 while Steve and I were visiting Asheville, North Carolina. The store is Yarn Paradise. Yarn: One skein each of Claudia Handpainted yarn in Plumicious, Koigu KPPPM 581, and Koigu KPPPM 470. Timing: I started the scarf in February of 2011 and finished it in December of 2011. The fabric created by the linen stitch is very different from regular knitting. It has an almost woven feel. Great pattern, and I love the result. 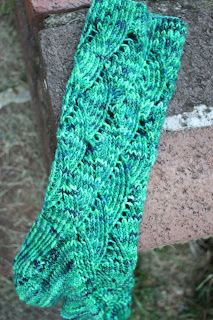 My Deep Water Socks are so named because of the Knitpicks yarn I chose for them. They took a long time to knit -- from April 2011 to February 2012 -- not because of their difficulty, but just because of my time devoted to them. 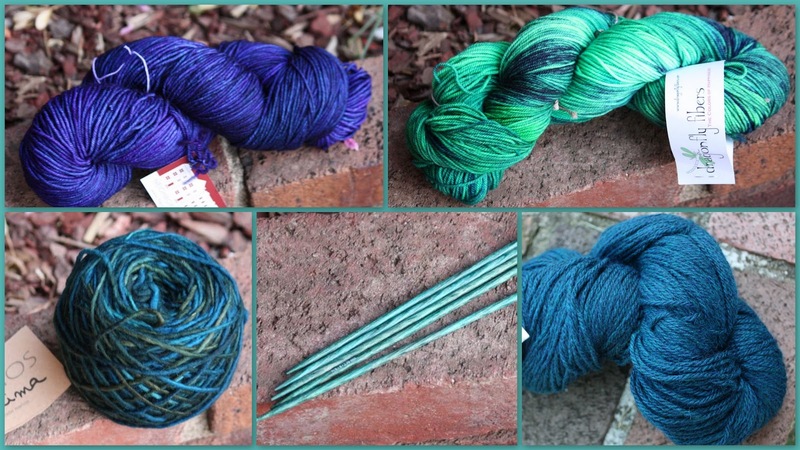 Yarn: Knitpicks Stroll Tonal in the Deep Water color. It's a blend of blues and purples, and it appeals to me both because of its color and its name. 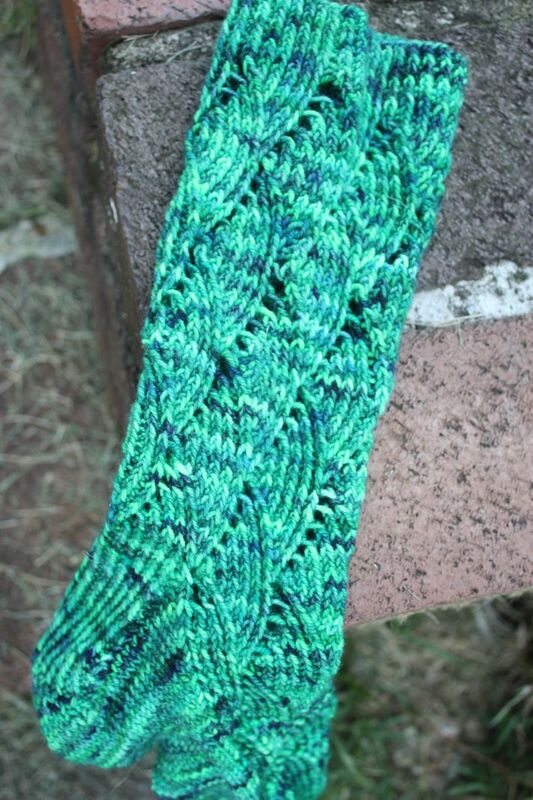 Pattern: The Yarn Harlot's sock recipe from the book Knitting Rules. 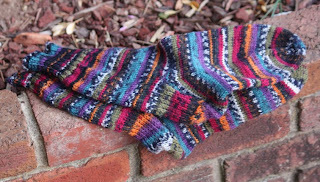 Pattern changes: I cast on 72 stitches instead of 60 and reduced the needle size down to a US 1 so that the fabric is thicker than the Emmaus socks. I changed the heel to a short row heel from the Rockin Socks pattern from Blue Moon Fiber Arts. I had trouble with the heel the first time I did it, but the second time was better. I'm not sure I would use this heel again -- might not be my favorite. Needle: US 1, DPN, Harmony. 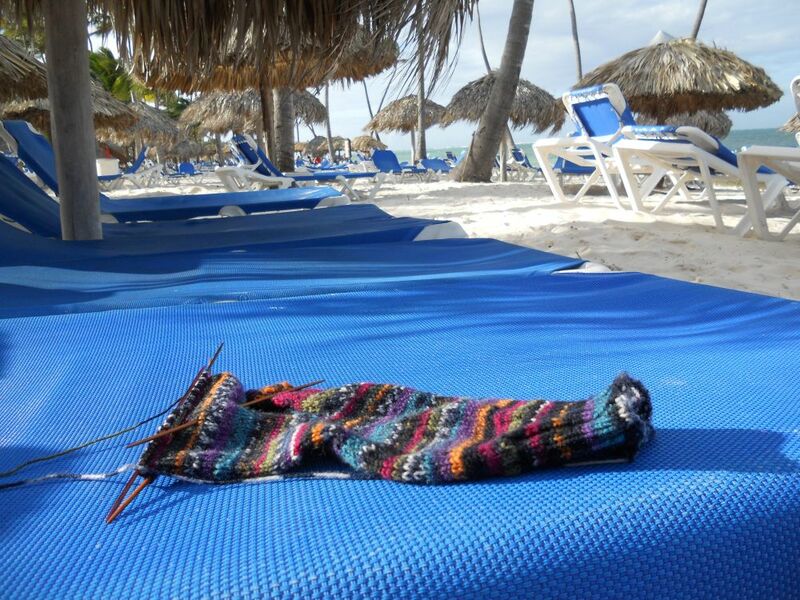 I finished these socks on the plan to the Dominican Republic and grafted the toe in our hotel room.